Why it’s not necessarily a good thing to be inspired by Native American art. Ok, let’s get the title explained right off the bat. I don’t mean to be provocative. It might sound like I’m faulting Native American art here, but the accusatory weight is meant to fall on the inspired part. What I mean is that there is something reductive in the way non-natives claim that they are inspired by Native American art. It’s something that’s heard quite a lot. From Jackson Pollock to Ralph Lauren, artists and designers often cite Native American art as an influence. For fashion designers it seems particularly commonplace to go Native for a least one collection. Of course, when asked, the inspired will always assure their utmost respect and admiration. But a lot of the times one wonders if it doesn’t do more harm than good. One might argue that when someone like Ralph Lauren incorporates Navajo motifs into his designs, it raises interest in Native culture. This may very well be the case, but it also reinforces the view of Natives as a faceless group of “others”. Because it’s rarely the unique style of an individual Native artist that is cited as inspiration, it is always “Native art” en masse. Outsiders all too often seem to regard Native designs as interchangeable and all alike. This may also explain why there is a baffling lack of collaboration between the inspired and the ones who they are inspired by. Because if one fails to distinguish between different styles, I can see that it would be easy to believe that anyone can do it. It really shouldn’t be so hard to realize the benefits of collaboration. After all, designers want competent seamstresses, right? So of course they will hire the best in the game. And if you want some cracking Navajo designs, you should probably get in touch with someone who knows what they’re doing. But this very rarely happens. The much publicized court case Navajo Nation vs. Urban Outfitters offers some insight into why those inspired seldom think it necessary to go to the source for help. The story goes that the clothing company Urban Outfitters had used Navajo designs and motifs for years. In 2012, the Navajo Nation finally took legal action against the company for violating the Indian Arts and Crafts act, which prohibits trying to pass off artefacts as authentically Native when they are not. According to Urban Outfitters’ defense Navajo patterns are a generic style of design that anyone can use. Recognition of the individual behind the artwork rather than the group should really be the source of inspiration. Otherwise one gets inspired at the cost of preconceptions and generalizations. Maybe it is time to stop talking about Native Art all together. The contemporary art done by Native Americans is so diverse in style and content that it becomes difficult to speak of in terms of a particular grouping of art. It is, in short, art done by Native Americans rather than Native American art. Nicholas Galanin juxtaposes tradition and the contemporary in unexpected ways. 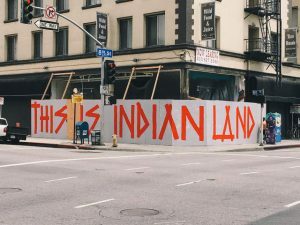 In lists of the “native-artists-you-should-know” kind, the name Nicholas Galanin features prominently. He is certainly no idler. He makes jewellery, he makes art in a variety of different media and he sings in a band called Silver Jackson. Having multiple functions does not mean he is unfocused. It just means he doesn’t do what’s expected. While attending art school, the teachers expected him to abandon his roots in the traditional imagery of his Alaskan Tlingit tribe to be more contemporary. He didn’t. Instead he put it into dialogue with contemporary times. 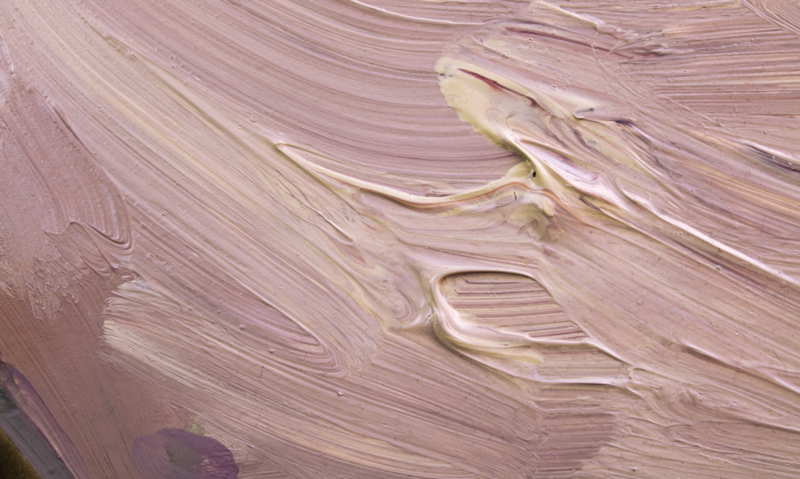 The unexpected is also a word that comes to mind when thinking of his art. 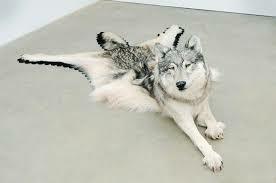 Like a taxidermied polar bear or wolf suddenly losing its form and becoming a rug midway through. 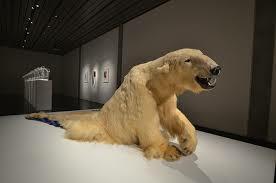 In his art, some of Galanin’s key methods are comparison and juxtaposition. And, again, the results are quite often unexpected. 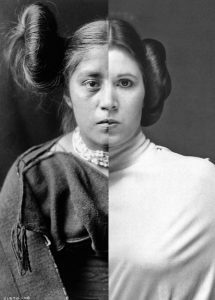 As in “Things are Looking Native, Native’s Looking Whiter” (2012) in which Princess Leia from the “Star Wars” movies is juxtaposed with a Native American woman with traditional attire and hairstyle. The meeting, or confrontation if you will, of traditional and contemporary can also be experienced in the two-part video Tsu Héidei Shugaxtutaan (2006), in which a Tlingit dancer does his thing to a contemporary soundtrack of wobbly dubstep, and a non-Native break-dancer interprets a Tlingit song. The result is so captivating that anyone questioning the relevance of traditional cultures for contemporary times gets food for thought. As firm believers in the dialogue between tradition and contemporary, Kiva Gallery sympathizes wholeheartedly with Galanin’s artistic methods. Galanin shows that not only does this dialogue generate exciting visuals but also knowledge and insight.